What is the flag of Fiji? Find out about Fiji's national flag and the history of it. We also delve into the other Fiji flags that are in use. This is the current flag of Fiji which was adopted on 10 October, 1970 when it gained it's independence from the United Kingdom. It remained unchanged when it became a republic on 7 October 1987. 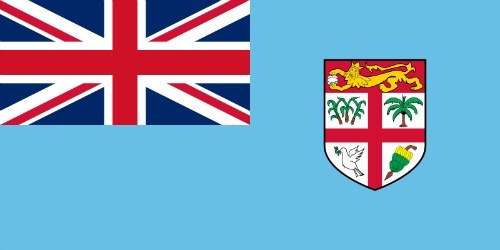 The light blue background symbolises the Pacific Ocean, which is important to Fijians in terms of fishing, a traditional livelyhood, and to the important big tourist industry. The Union Jack signifies it's link as a colony with the United Kingdom. The shield is the nation's offical coat-of-arms which contains important images of the nation including: important agricultural crops such as sugar cane (upper left), coconut palm which produces copra (upper right), bananas (lower right), it also contains the dove of peace (lower left), and also of it's history symbolised by the British Lion which is holding a cocoa pod. The colonial era ran from 1874, when it was ceded to the British Empire, to 1970, when Fiji gained it's independence. This Fiji flag is stated to have been used from 1924-1970. What flag was used between 1874 and 1924 is unclear. It's similar to the current flag with the main differences being: the dark blue background and the use of the whole coat-of-arms. The Great Council of Chiefs called for the whole coat-of-arms to be placed on the current flag. kalou ka doka na tui" ("Fear God and honour the Queen"). 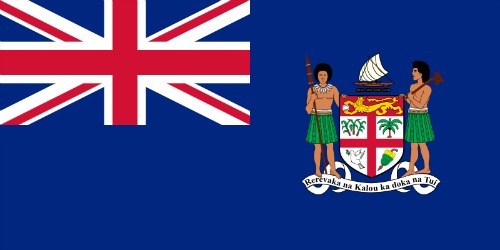 This is the flag used during the Kingdom of Viti from 1871-1874 before ceding to the British Empire in 1874. 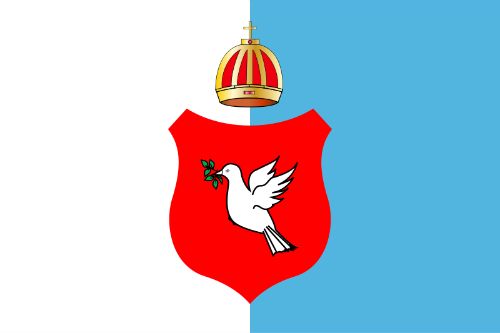 It features blue and white vertical stripes, with a red shield depicting a white dove in the centre. In 2013, Prime Minister Commodore Frank Bainimarama in his New Year's Day address stated that the flag would soon be changed. He stated that the reason for the change was "to reflect a sense of national renewal, to reinforce a new Fijian identity and a new confidence in being Fijian on the global stage". Fiji had removed the Queen from it's currency a few weeks earlier.